Buttigieg has the impressive résumé one would expect from an aspiring presidential candidate. Born in South Bend, he was valedictorian of his high school, then went to Harvard and received a Rhodes Scholarship. He became a Naval Reserve officer and served in Afghanistan as an intelligence officer. He’s worked in elite business and Democratic political circles, doing a stint at McKinsey and Company and on John Kerry’s presidential campaign. Mayor of South Bend is an odd platform from which to pursue the presidency. Being a mayor of any sort is typically a dead-end job. Only three presidents have ever served as mayor, the last being Calvin Coolidge. Perhaps because of resentment against big cities, mayors aren’t often elected governor of their states, either. The Washington Post observed that making that leap is “rare.” Cory Booker’s rise from celebrity mayor of Newark to the U.S. Senate perhaps inspired others to see City Hall as a stepping stone to greater things, but it remains an atypical trajectory. For Democrat Buttigieg, running for mayor may have reflected limited political options. Indiana is solid red, with Republicans dominating the state since the election of Mitch Daniels as governor in 2004. Buttigieg tried running for state treasurer in 2010 but was crushed by Republican Richard Mourdock, getting only 37.5 percent of the vote. Though being gay may seem like a negative in socially conservative Indiana, the real scarlet letter for Buttigieg is the “D” after his name. However, Mayor Pete’s interview *really* impressed me. Putting aside policy positions, from a pure superficial political standpoint, he’s definitely an extremely gifted communicator (e.g. instant charisma on the screen – I don’t know if it’s quite Reagan/Obama-level political charisma, but he comes across very well). 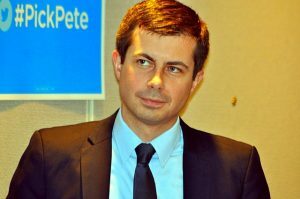 This is a person that within five minutes of hearing him speak completely convinced me that he should clearly be destined for a much larger office than the Mayor of South Bend, but as you’ve noted, it would be practically difficult to become Governor or a Senator of Indiana simply because he’s a Democrat. Realistically, Buttigieg will have an uphill battle in the Democratic primary with so many established names entering into the ring. Still, I actually think he’s a good enough communicator to break through the clutter quite a bit and raise his national profile significantly. While he’s a white male, he’s also sort of a “unicorn” within the Democratic Party by being an openly gay veteran. Don’t discount the power of being able to preface any national defense or foreign policy discussion with, “When I *served* in Afghanistan…” Buttigieg may not be able to win the nomination, but he could leverage the publicity that comes with a Presidential run to the point where he ends up being a viable VP choice or, even more likely, a Cabinet member in a Democratic administration. I also think that being an openly gay man may also give him political cover as a Democrat to be a white man. That is, it may allow him to get by without having to disavow whiteness or masculinity, which could be very important in trying to pick up working class white voters in key states like Ohio, Michigan, Pennsylvania, and Wisconsin (not to mention Florida, which is its own political universe). Funny how a gay man could in some ways be viewed as a vehicle for reassuring people about the status quo. Also, there is no such thing as solid red anymore. Texas which is more redder than Indiana has recently become more pinkish. In fact I predict that even very blue California and New York will be less blue after 2024 as La and New York City barely grow and large counties like Riverside or Long Island grow faster. In the case of Riverside which grew about 10,000 more people than Los Angeles County it is more tolerant toward the others political view. The Atlantic gave Riverside a low 12 percent for intolerant and Los Angeles County a high 82 percent. In 10 to 15 years, there will be less red or blue and more purplish as people leave the coastial states of California or New York for inland states that are cheaper. Not sure if you monitor Indiana media actively, but Mayor Goodnight declared about three weeks ago that he will not run for another reelection. At least this is giving the Midwest more attention. It’s becoming more and more clear that this is the swing region that will pick the next president. You had to be raring to go, one way or the other, 3 weeks ago. Does Northern Kentucky not really count as part of the southernmost Ohio “C”? Regarding higher office, I’ve always felt that the Region + South Bend should go their separate ways from “real” Indiana. Nice little profile! Interesting. I’ve noticed that this “next” generation of politicians – currently in their 30s and 40s, mostly – is much more sympathetic to and understanding of urban development. It seems realistic to imagine a serious, nuanced question or two about urban development being asked at a presidential debate within a decade or two. Not just, “We need to help our urban poor.” (Which, of course, we do.) But actual, serious talk about rail, density and rightsizing. I’ve noticed a change in my own adopted hometown of Lansing, MI. Our previous mayor was good at pursuing development and he certainly wasn’t anti-urban, but he was a little slow at adopting modern urban best practices. Our new, younger mayor is pursuing modern urban approaches much more aggressively. It’s nice to see these changes popping up in smaller Midwestern metros. I’ve been to South Bend. It has some solid assets: Notre Dame, urban neighborhoods, fun businesses, a river trail, and a convenient rail connection to Chicago. Maybe you can’t commute to Chicago from South Bend, but the idea of living in South Bend with that awesome Midwest cost of living, and then taking a 2 hour train ride to Chicago for the weekend now and then sounds appealing to me. LOL. It’s only a one-hour drive to the Loop on weekends (from the Notre Dame portion of South Bend)…and you’d need a car to live in South Bend. OK…90 minutes. But not bad for a weekend trip. I prefer taking the train into Chicago even though I own a car. It’s a nice to take a break from driving everywhere when you’re somewhere dense with good transit. That’s just a personal preference, though. I agree that your average person in South Bend would want to own a car. This is somewhat of a digression from the topic…but it will snap back. High-skill, high-income, mobile people have had the option to work remotely for some years now. If you want to live in South Bend and have a national professional footprint, it’s certainly possible. Even for those whose work is localized, our networks are virtual. For example, I regularly communicate with a number of people who read or participate here (including our host) on topics that inform my work. None of us live in the same city, even though we all work in related/adjacent fields and have ideas to offer one another. One of these people I see at least once a year; one I’ve met a couple of times face to face; one I’ve only ever talked to on the phone or via email. Now…is it more or less likely that I will continue to share ideas with these folks as advances in communication continue? In general, will people’s professional networks grow virtually or will they require frequent in-person contact? It is certainly not outside the realm of possibility that someone from South Bend could build a national reputation…indeed, the blog post demonstrates that. And Mayor Pete did it without a fast train to anywhere and without an office base in Chicago. This is all about reconnecting marginalized places economically and politically. Trains can do that. Political candidates can to. My point: People connect and reconnect and build networks by many means other than transportation infrastructure. Today, transportation infrastructure is less important than communication technology. If you were arguing for reconnecting marginalized places by fiber-optic broadband, I’d agree with you. Trains provide far less bang for the buck in this realm. Think about what happens when there’s a “paralyzing” snow storm today: many working adults just work from home, and schools employ distance learning. As long as the power’s on, the roads don’t matter. Why are people willing to pay such absurd prices just to be in booming coastal cities while those in places that shall not be named can’t give away their real estate? It’s because physical access to professional networks has only grown in importance with the commodification of lower skill labor online. The answer to coastal cities’ growth constraints are the same as those for marginalized areas in the Midwest…to open new areas to development and give people more ways to calibrate their choice of location in the new economy. That’s the logic of the high speed rail line in California, new and improved subway lines in NYC, and even new streetcar lines in many urban centers. Access is the issue of the 21st century that will allow people to play both sides of the new economy…the commodification of lower skill work online and growing value of specialized, complex, non-commodified work that is still done best in person. It’s an important way to counter the all or nothing economy that developed in the last 20 years. Think about it…It takes an hour and a half to drive from South Bend to Chicago’s Loop and it takes the same time to drive from one side of the Bay Area to the other. We think of LA as one city, yet driving from southern fringes of metro LA to it’s northern exurbs took me 2 hours in good traffic last year. I think that electronic networking can serve people who are already established in their careers pretty well. But for people who are just getting started, I think facetime is essential, especially because a lot of professions have an unofficial apprenticeship structure in which your first job or two are essentially apprenticeships. So during that phase in your career it is really important to be around people in your profession, asking them questions, getting feedback, and also, if the job isn’t going well, finding a better situation in which to develop your career. Agreed, and this is not at all new. It harkens back to the guild system of Renaissance Europe. My point stands: the vast majority of working professionals are not 21-30 year old apprentices. Once their network is built, it can be virtualized. No train needed. Tech might allow some marginalized places to prevent their further marginalization, but I can’t see it improving the importance of any place on it’s own without significant new transportation investments. Is the goal survival or renewal? Is the new economic geography set for generations to come? I think that what will happen is that as the US grows, more of the lower value professional white collar work will migrate to the sunbelt, and some select cities in the Rust Belt/Great Lakes/Midwest/River Towns area. It doesn’t make a whole lot of sense to have all of your ho-hum software engineers and programmers, accountants, etc., located in NYC, Boston, SF, or LA. Those things can be done at an acceptable quality level in Columbus, Dallas, or Tampa, and at a lower cost. They still mostly cannot be done at an acceptable quality level in India or China, and that may be true for quite some time (if it was easy to do it would have been done by now). So there will be more cities that start to resemble Columbus or Indianapolis or Raleigh or Charlotte, etc, while property prices continue to climb in the top cities in the US. So, you do think the new economic geography is set. You don’t see a continued shuffling of the deck driven by tech as has occurred in the last 20 years. No more break out stars like Columbus, Seattle, Nashville, Charlotte, Austin, or Denver pushing themselves up the rankings, but no more declining metros falling down the rankings either under the weight of aging populations, old infrastructure, and incestuous local vested interests, like St. Louis, Pittsburgh, or the city that shall not be mentioned. The Great Reshuffle is over and where ever you find yourself is where you shall remain. I’m not sure if this is true, but it’s an interesting perspective. It certainly argues against the strenuous efforts at metro economic development we’ve seen in some places. If the game is no longer going to be played as it was, what’s the point? Amazon’s problems in NYC may be a sign that the ability of global capital to reshuffle the economic deck is fading. Many in my city will be very glad to hear that the storm is over and that they can return to their time-tested ways unbothered by new opportunities.